Humidity instruments and humidity sensors can sense a number of different factors and are available in a variety of forms, including digital humidity sensors and hi tech humidity sensors. Absolute humidity, expressed as grams of water vapor per cubic meter volume of air, is a measure of the actual amount of water vapor or moisture in the air, regardless of the air's temperature. Find Humidity Sensor Products / Instrument: Capacitive Humidity Sensor, Resistive Humidity Sensor here. A relative humidity sensor (RH) or relative humidity instrument also measures water vapor but as a percentage, relative to the temperature of the air. The dew point temperature, which provides a measure of the actual amount of water vapor in the air, is the temperature to which the air must be cooled in order for that air to be saturated and dew to form. Because of the intertwining of atmospheric measurements, humidity measurement instruments are sometimes equipped with pressure and temperature sensors as well. Three main applications for humidity measurement instruments are judging moisture in gases or air, bulk solids or powders, or in fuels or other liquids. Humidity sensors are also widely applied in weather instruments, weather measuring instruments and combined humidity and temperature sensors. There are many technologies for humidity sensors. Capacitive or dielectric humidity instruments have a material that absorbs moisture, which changes its dielectric properties and enhances its capacitance. Chilled mirror technology uses a mirror that is chilled to the point that moisture starts to condense on it. This temperature is the dew point. With electrolytic technology, moisture is proportional to the current needed to electrolyze it from a desiccant. For resistivity or impedance style humidity sensors, a material absorbs moisture, which changes its resistivity or impedance. In strain gage humidity instruments, a material absorbs water, expands and is measured with a strain gage. Psychrometers, often called wet/dry bulbs, measure relative humidity by gauging the temperature difference between 2 thermometers, 1 wet and 1dry. One critical specification for humidity sensors is the humidity or moisture range to be measured or else the dew point range. Humidity and moisture accuracy is expressed in terms of percentage of measurement. The dew point accuracy, since this is a temperature reading, is expressed as a variance in temperature output. 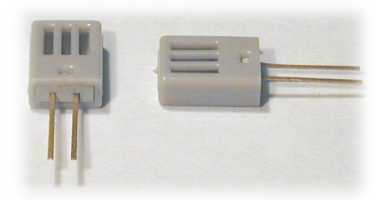 Outputs from humidity measurement instruments can be analog current, voltage, or frequency; digital, including computer signals; or a switch or alarm. Humidity sensors can have analog, digital or video type displays and can have a number of different form factors. 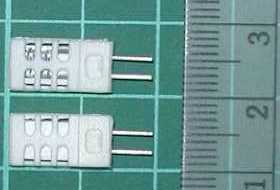 They can be PCB-mount devices, standard sensors or transducers, or a simple gauge or indicator. They can also be various types of instruments, whether handheld, benchtop or mounted. In addition to pressure and temperature compensation, humidity sensors can have a number of features to make them more useful or easier to use. Humidity sensors can include data logging, event triggering, self-testing, self-calibration, and battery power.